Sales in two aluminum boat categories and the largest segment of fiberglass boats saw solid gains in December, contributing to 9.2 percent growth in the industry’s main powerboat segments and brightening what is typically the slowest sales month of the year. Sales of aluminum fishing boats climbed 13.8 percent, to 694, compared with December 2010, and sales of pontoon boats rebounded from a downturn in November 2011, rising an even larger 22.7 percent, to 222, from December 2010, according to figures compiled by Aarn Rosen, national sales manager at Statistical Surveys Inc. The two categories were strong performers for much of the year, and they helped to lead the main powerboat segments — five fiberglass categories and the two aluminum groups — to a 2.2 percent gain in sales, to 76,625, for all of 2011. Sales of pontoon boats rose 10.6 percent for the year, to 15,579, and sales of the fishing boats rose 5.4 percent, to 19,804. Industrywide, sales in all categories for the year fell 1.8 percent, to 121,210 boats. In December, sales in the high-volume 11- to 40-foot outboard fiberglass segment rose 10.5 percent, to 1,040 boats. Sales in the core 14- to 30-foot fiberglass segment were up only 0.7 percent, or two boats, to 274, but they improved from November 2011, when they fell 2.9 percent. Sales of all fiberglass boats, including personal watercraft, rose 3.8 percent, from 1,922 units in December 2010 to 1,997 in December 2011. Sales in the main powerboat segments totaled 2,319, compared with 2,124 in December 2010. Sales industrywide rose 7.6 percent, to 3,322 boats. December is typically the slowest month of the year, and sales for the month traditionally represent about 2 percent of the year’s total volume. 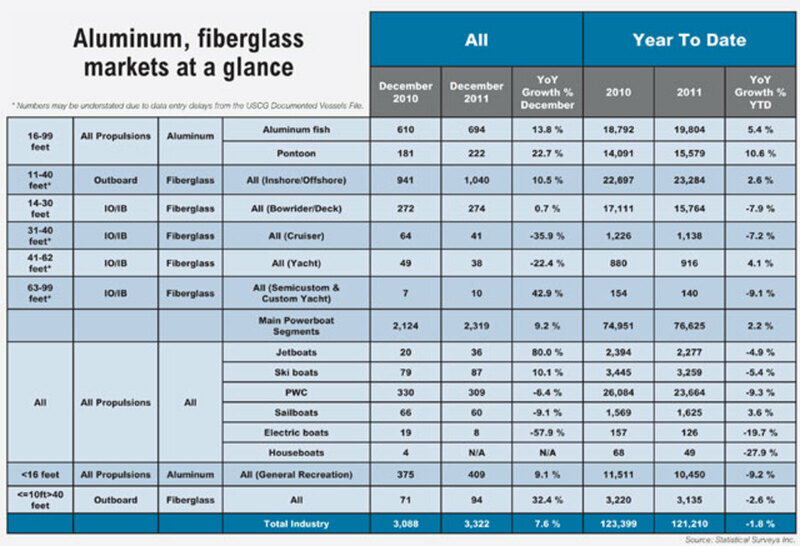 “[The data] was following a trend of continued improvement, but nobody holds their breath for December numbers,” says Rosen, adding that he was pleased to see the 14- to-30-foot fiberglass category inch back upward. The December sales information is based on registration data from 28 early-reporting states, or about 63 percent of the nation’s boat market. Reports of sales of documented vessels were complete only through Oct. 18 because of data entry delays at the Coast Guard. For that reason, Rosen says, sales figures for boats 30 feet and larger are significantly understated in the data. Sales of fiberglass boats in the lower-volume 31- to 40-foot cruiser category and 41- to 62-foot yacht group fell sharply in December, but sales in the 63- to 99-foot semicustom and custom yacht group rose to 10 boats from seven a year earlier. “It was only three boats, but it was three million-dollar boats,” says Rosen. Sales of jetboats were up 80 percent, or 16 boats, to 36, and sales of ski boats rose by 10.1 percent, or eight boats, to 87. Sales of personal watercraft fell 6.4 percent, to 309, and sailboat sales fell 9.1 percent, or six boats, to 60.